Acadian Genealogy Homepage; Special Message(s)! a) My latest project, includes the creation of an "Acadian-Cajun & French-Canadian Online Boutique" where folks can source wonderful (and very unique) gifts on which their own family crest have been affixed. Connect to my crest page (and follow the links from there) to view your own surname crest and, if yours is still not listed, please send me an email message, so I can source and post. b) I am now issuing a monthly Acadian-Cajun Newsletter, providing much needed Acadian-Cajun resource information. This letter is "free", on the basis that you provide me your _complete_ name (for my records ONLY). Connect to the link just below, to view my "Privacy & Security Policy". c) I am now using (and highly recommend webmasters to consider) the wonderful program, Link Machine to rebuild the links page(s) of my web site, which was destroyed during a major computer crash in 2005. 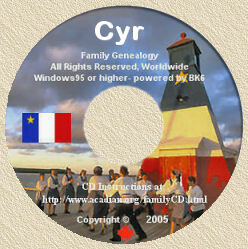 I've now created and released a series of over 100 different Acadian Families Genealogy [ ©2002 to current date ] CD-ROM's for specific Acadian Families. So happy to confirm that (finally), you can order copies of my "In Search of Our Acadian Roots [ ©1994 to current date ]" and/or "Acadian-Cajun Family Trees [ ©1999 to current date ]", Online using Visa Credit card. None of my CDs can ever go out-of-date! Very pleased to confirm that my new "Acadian-Cajun Family Trees" CD, is NOW AVAILABLE! Click here for complete details. None of my CDs can ever go out-of-date! PS: The surgery date has now been set... September 9, 1999! Be advised I am no longer accepting data for my second CD! If you have not already sent your GEDCOM, please DO NOT send it to me now! For your added information, be advised that I fully anticipate completing my second CD by July 1999 and will provide additional details as soon as it becomes available. GOOD NEWS, for you! I've extended the deadline for receiving your GEDCOMS, to the end of February 1999! This will be the ONE and ONLY extension of the latest date which I will accept your GEDCOM for inclusion in my second CD-ROM. The disks must be received by February 28, 1999, to be included. Read the balance of this Page for details on participating in this exciting Project... which will be completed in time for the Congrès Mondial Acadien this summer. This is my seventh and final message reminding everyone who have indicated an interest in participating, of the possible (second) Acadian Genealogy CD-ROM which I am contemplating producing, to be available in mid-1999 (in time for "Le Congrès Mondial Acadien; Louisiane 1999). In my last e-mail, I confirmed that I had received commitment for over ONE MILLION names however, to date the GEDCOMS received only total approximately 450,000 names... unless I achieve the minimum one million goal I set for myself, I will NOT be proceeding with the project of producing a second CD! 1. All data must be in GEDCOM format. 2. Data must be primarily Acadian to qualify. 3. GEDCOM(s) must be sent to me on high-density floppy disks ONLY, via prepaid postal mail... data submitted electronically via e-mail, will NOT be accepted. 4. I reserve the right to reject any/all data submitted which, in my opinion, does not qualify. If/when this occurs however, I will advise the person(s) submitting same. Rejected (or accepted) data will NOT be returned to sender. 5. While the submission of your data serves to release same of any/all copyrights to me, every effort will be made (as was done with the first CD) to protect reproduction as a whole. 6. All participants are guaranteed a copy of the finished CD at the lowest possible cost, but please do not send money until requested to do so. I anticipate that participant cost will not exceed $25. US however, final price will be determined by the cost of initial production. 7. While I may not be able to acknowledge all data received via e-mail to everyone individually, I will provide ongoing progress of the project, on my web site at the address listed in my signature. So, if/when you submit your data, check this Page to see if your name is listed...if it is NOT, then I have not received your data (and you need to follow-up with me). Many thanks in advance for your anticipated support and cooperation. PS: For those wondering, "yes" the _first_ CD is still available...and will continue to be, given the fact that I anticipate there will be at least 90% _new_ participants for this 2nd CD, which will make it entirely different than the first! PS: If you have already submitted your GEDCOM, merely disregard this message. If you know of others who might be interested in participating, it's not too late...put them in touch with me quickly. To date I have received GEDCOMS representing approximately 300,000 names for the second Acadian CD. Keep in mind that things will happen fairly quickly once I hit the magic one million names...so, don't be disappointed...act quickly and send me your GEDCOM...today! PS: See below for complete details on participating. PSS: Also, keep in mind that this 2nd CD WILL BE ENTIRELY DIFFERENT THAN THE FIRST ONE! So, if I am able to complete this project, the two separate CD's will provide you/us genealogical information on a total of at least one and a half million names! The e-mail message I received from Roger Lebrun today committing to 6,000 names has, as you can see below, put us over the top of the ONE MILLION NAMES goal I had set for myself, to proceed in producing a second Acadian CD-ROM. 2. Data must be _primarily Acadian to qualify. 4. I reserve the right to reject any/all data submitted which, in my opinion, does not qualify. If/when this occurs however, I will advise the person(s) submitting same. Rejected data will NOT be returned to sender. 7. While I may not be able to acknowledge all data received via e-mail to everyone individually, I will provide ongoing progress of the project,on this site. So, if/when you submit your data, check this Page to see if your name is listed...if it is NOT, then I have not received your data (and you need to follow-up with me). Many thanks in advance for your anticipated cooperation. Well here we go again...maybe! I've received so many many great messages from the tons of wonderful Cajun-Cousins and friends I've met on-line, inquiring if I'm giving any consideration to producing a _second_ "In Search of Our Acadian Roots" Genealogy CD, that I'm now _seriously_ thinking about it! Yeah, yeah, I know...I'm a bear for punishment! Those of you who've come to know me, know that I like to set my goals mighty high and, in that vein, I would only consider proceeding if I felt 'comfortable' that the number of names would *exceed* one million! As a matter of fact, I've had some preliminary discussions with a major Canadian Genealogy Society and, if they decide to participate, I might just adjust my personal goal to *TWO million* names! I've learned many things with the production of the initial "In Search of Our Acadian Roots" CD and would, in addition to the increased size, want to make some major improvements. This would again be a non-profit project, so the "participation" of as many "Cajun-Cousins" as possible, would be crucial to its success. 1. The surname of the _FOUR_ major Acadian Families you are researching. 2. The present quantity of names in your database. To be honest, I DON'T ANTICIPATE COMPLETING THIS PROJECT UNTIL AT LEAST 1999 (at the earliest), hopefully in time for the Congres Mondial Acadien scheduled for Louisiana, so you may want to 'estimate' how many names you would have in your database, by then. But please provide _conservative_ 'guesstimates'...I want realistic numbers! I will add your name to my E-Mail Address Book and provide additional details, if/when I decide to proceed with what, I'm certain, would be another massive undertaking! Not unlike the _first_ "In Search of Our Acadian Roots" CD, I reserve the sole right to reject any GEDCOM's which do not meet the criteria's outlined. My personal ONE MILLION names goal, has now been reached so I am pleased to confirm that I will be proceeding with the production of a second Acadian CD, to be available in 1999. So, still lotsa time for _you_ to participate...just get in touch with me via e-mail. I want to take this opportunity to wish you all a very Merry Christmas and the Happiest of Holiday Season! And I want to sincerely thank each and everyone who have, in one way or another, supported me and this Project...you know who you are! Lastly, I want to remind everyone that the historical "In Search of Our Acadian Roots" CD-ROM, continues to be available directly through me and at the original cost price...what a great (and lasting) Christmas Gift for friends or grandchildren! Thanks to the many prayers dedicated by so many of you, you'll be interested to know that "the kid is back home and running again"! Well, not exactly "running", but certainly doing lotsa "walking"! While I'm still kinda hurtin' all over, I'm happy to report that, according to my surgeon, the double by-pass operation was successful in every respect. I tried to talk him into installing a "zipper"...or at least use velcro (for future convenience sake), but he obviously doesn't share "my kind of humour". And for those wondering what I've been up to, if you've found this Homepage, I think that answers the question! Once again folks, I want to sincerely thank each and every one of you who sent "good wishes", "get well cards"....and especially "prayers" my way! You are one super bunch of Cajun-Cousins! 1. First and foremost, it would be a *NON-PROFIT* Project. 2. The CD-ROM would include information on a minimum of 400,000 names. 3. To "stay healthy" and be able to complete the Project! 4.To achieve as large a distribution of the CD, as possible. With the help of 134 participants, sourcing the data was the easy part... but I must say that once I started realizing what the costs would be, I sincerely felt that there was no way this could ever become a "break-even" proposition. Well folks, I'm pleased to confirm that, to the best of my knowledge, I've recovered all my expenses! As you can see in the "progress reports" of the Project on the CD, I initially struggled in getting enough participants and there were "times of doubt". But, thanks again to the 134 participants, the final name count on the CD is...519,008! As many of you know, I have a severe cardiac condition which actually started about 15 years ago when I was 39 years old. Well, the "ole boy" hung in there and the Project was brought to completion in February 1995. Only I will ever know how much moral support I received from the majority of the 134 participants...and those of you who "were there when I needed you most", know who you are. Yes, it's true I'm now scheduled for my SECOND heart by-pass on June 26, 1995, but hey, I know I've got at least 134 persons out there, throwing a "little prayer" my way...so I expect to be up-and-running again in a couple of months! This was the tough one! Initially my intention was to have the "In Search of Our Acadian Roots" CD produced for the 134 participants only. But I quickly realized that the cost would be exorbitant to only have 135 CD's (yes, I wanted one too), produced. So I decided early on, that I would make it available to anyone (at COST PRICE) who placed an order prior to production deadlines. Well, I no sooner had placed what I thought was the final order with the manufacturer, when I received additional requests. Fortunately, at the 11th hour, I was able to make arrangements with the manufacturer to provide me an "overrun on consignment", which so far has allowed me to fill all orders. But up until last week, I remained very concerned that I would "run out of stock" well before I could achieve this goal. Well folks I'm thrilled to let you know that I have now achieved my final goal! I have just completed a legal agreement with the manufacturer, which will ensure continued supply of the CD (at the same price) for as long as there's a demand for it...and boy do I feel great about that! It became very apparent to me recently that, at this point, this has become a good "money-making" arrangement FOR THE MANUFACTURER...thus the reason they have no hesitation in making inventory available to me "on consignment". For your information, I retain the cost of packaging and postage and provide the balance of moneys received to the manufacturer...and I have no problems with that, as long as they provide inventory and don't increase the price. So here's the "deal" I've struck with them for an undetermined period of time: I have given the "complete/total rights" of the CD to the manufacturer (with copyright limitations outlined on the CD), in exchange for... a) them providing written/legal confirmation that they will continue to make available copies of the "In Search of Our Acadian Roots" CD for a period of time DETERMINED BY DEMAND! b) them allowing me to control future pricing, since orders will continue to be processed THROUGH ME. I can assure you, it'll be a long time before the price is increased from the current $49.US/$69.CDN ! c) them sponsoring and paying the complete cost of the Acadian Genealogy Homepage (which provides complete details on this Project) and which can be viewed by anyone having access to the WWW, at site: http://www.acadian.org/summary.html So folks, this will be MY last message, until a month or two after the operation but be assured, my wife Judy will process any/all future orders for the "In Search of Our Acadian Roots" CD-ROM on a "same-day" basis, as I have done in the past.